In today’s post we’ll continue our tour of the 2014 Hampton Designer Showhouse, by stopping into the laundry room, and then venturing into the first of several guest bedrooms on the second floor. 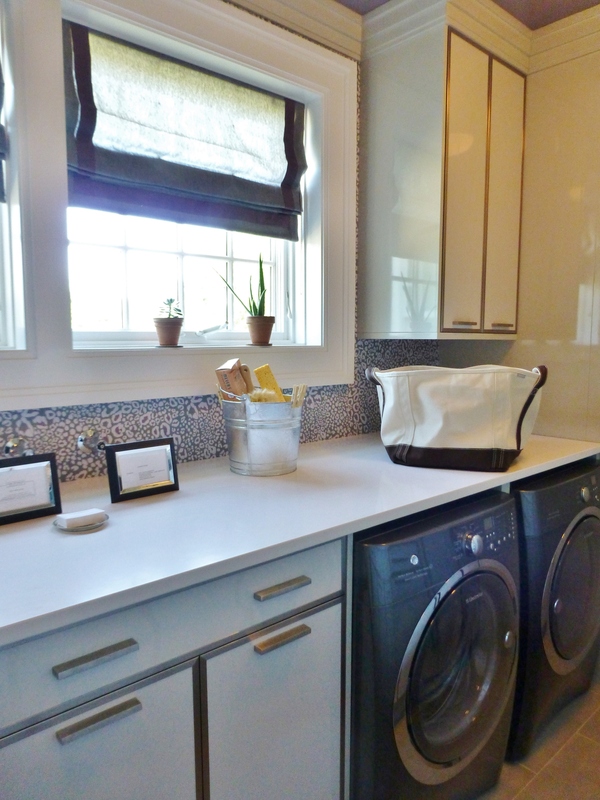 The laundry room at the 2014 Hampton Designer Showhouse was long and narrow. I love that the designers chose to keep things clean and simple, with tailored roman shades at the windows, white countertops and white cabinetry with sleek nickel trim. The cute leopard print wallpaper is the same color as the washer/dryer, roman shades, and painted ceiling. I think it would be a pleasure to work in this space, expecially with 2 sets of beautiful appliances by Electrolux (there’s another washer & drayer to the left). 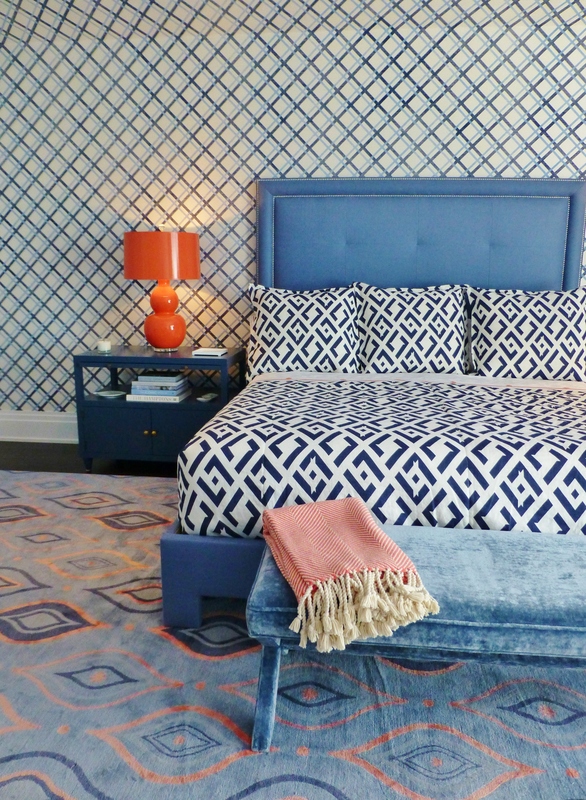 The blue and orange guest bedroom is designed by Mabley Handler Interior Design. The chandelier is truly stunning and sprawls across the solid blue ceiling. Notice how the bold trellis pattern wallpaper wraps up and onto the sides of the tray ceiling. The area rug drives the color scheme and has such a plush feel. There is a lot of pattern here, but the scale and intensity of each pattern holds its own. The bed features a solid blue upholstered headboard with double nailhead trim. The bed, painted nightstands, and bold orange lamps provide a place for your eye to rest. 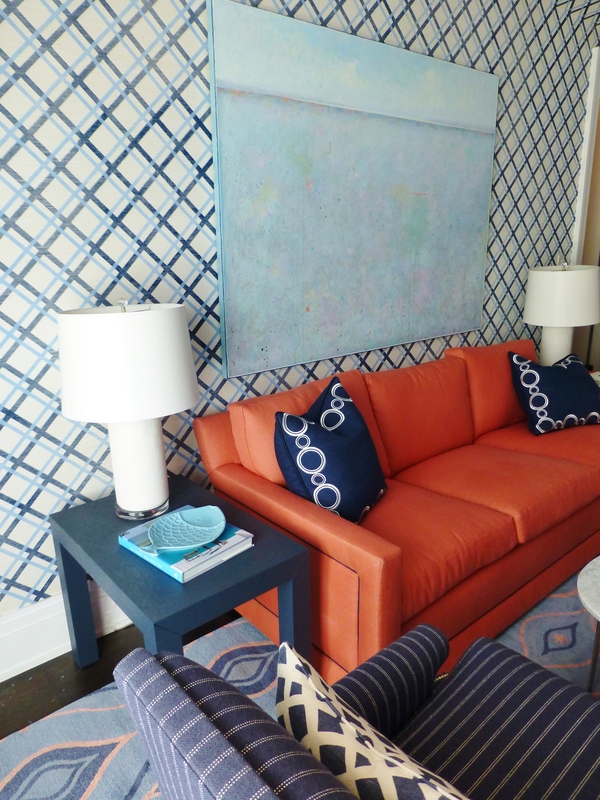 Across the room is a comfortable sitting area, featuring a bold orange sofa, which echoes the color of the bedside lamps. I really like the pinstripe chairs in a menswear-type fabric. The full-length draperies are fabricated in the same zebra patterned fabric as the desk chair, and are combined with a very pretty sheer. Near the door, the designers have placed a lovely navy blue desk and white painted chair, upholstered in the same zebra print fabric as the draperies. This bedroom has its own private bath, painted in a soft blue. 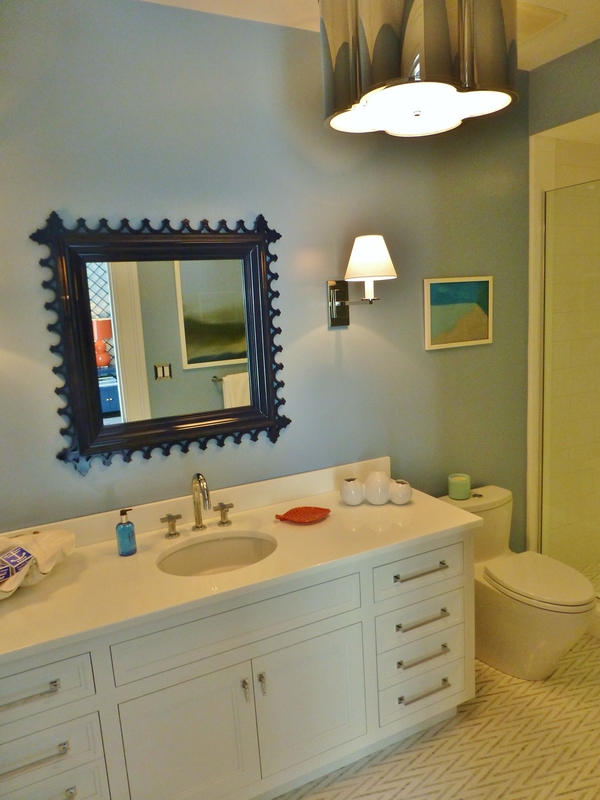 The designers chose a cute navy blue lacquered mirror and a terrific shiny nickel quatrefoil light fixture. 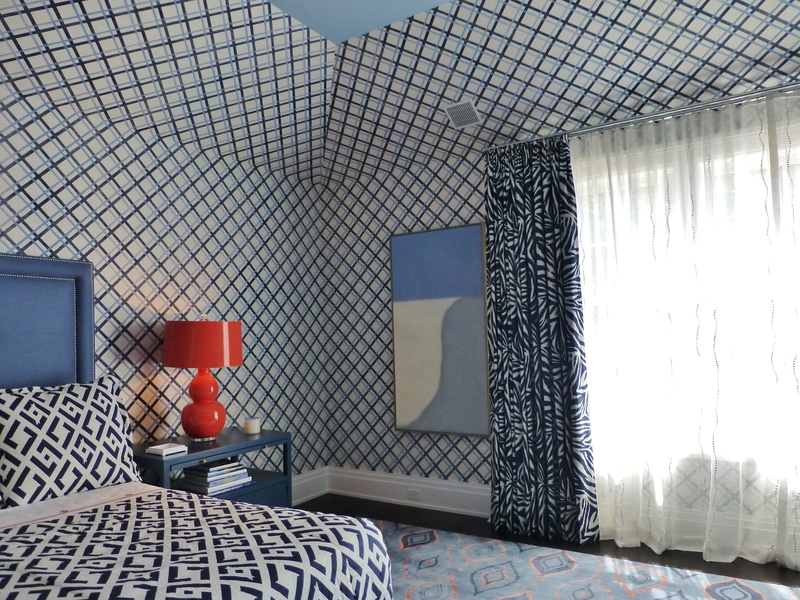 So, what do you think of this bold, patterned guest bedroom? The designers chose to go bold and use some brave color and pattern choices. It was pointed out in some of the online discussions that designer houses are the perfect place to do exciting and unusual combinations, and that viewers should consider a designer house on the same spectrum as fashion week, with its cutting edge and over-the-top designs. What are your thoughts? Next time we’ll visit another bedroom suite…there are so many beautiful bedrooms inside this mansion in the Hamptons. Until then, don’t forget to tell everyone you know about Kristine Robinson’s Interiors…I need all the friends I can get! 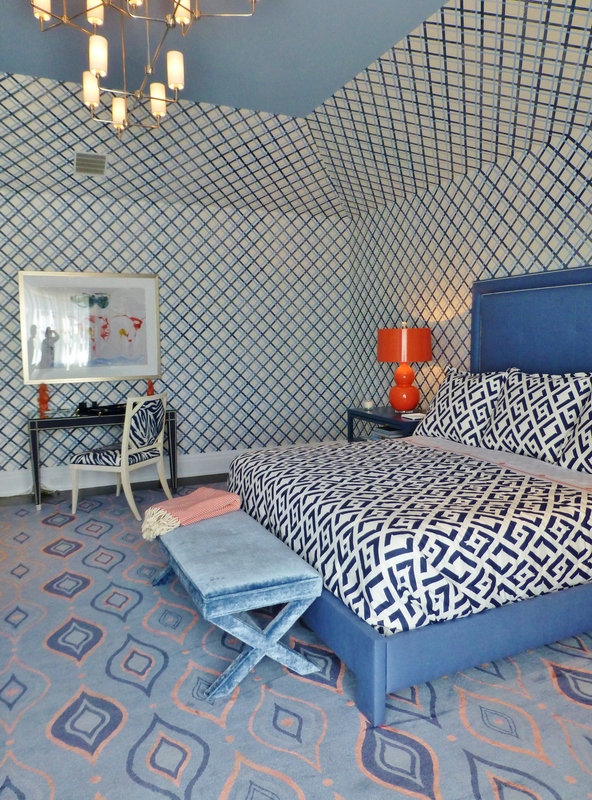 This entry was posted in Designer House, Home Decor, Interior Design & Decorating, Robinson Interiors, The Hamptons, Wallpaper and tagged Area Rug, Bedroom, Blue, Chandelier, Curtains, Draperies, Guest Bath, Laundry Room, Navy Blue, Orange, Tray Ceiling, Wallcoverings. Bookmark the permalink. Hey Kristine! Wow! That is one over the top bedroom for sure! I agree..if it was a “serious” bedroom (not for designer week) it would be over stimulating, but to showcase bravery in use of patterns and texture….this is amazing! It is so interesting to see the products of peoples minds, I would never have thought this far outside the box! As much as I believe patterns can be a bit busy and not for everyone, I enjoy the way the designer made the fabric choices work with one another. The only piece that seemed to stand out and not work for me was the fabric on the chair at the desk. I realize this seems silly given all the other pattern in the room but it seems to be the one thing that just stands out and doesn’t work well for me. I wasn’t able to tie it in and find the reason for the choice. Thanks for commenting, Beth! I believe the fabric on the desk chair is identical to the fabric on the drapery panels across the room…it just looks so very different pleated/gathered at the window. 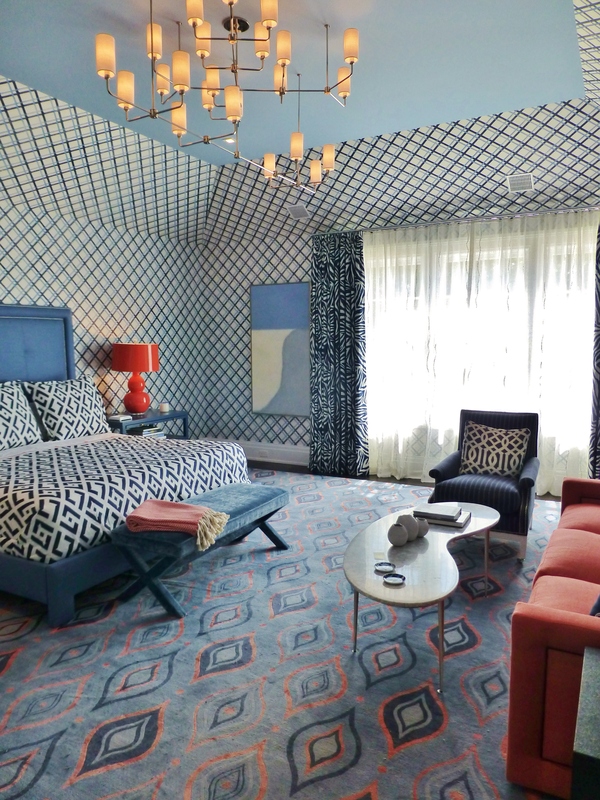 This room definitely has a lot of pattern play and is not for the faint of heart…but it has a very fun feel to it and I love the color combo! This design team is quite famous and does beautiful work. I think they must have had a lot of fun doing this space!